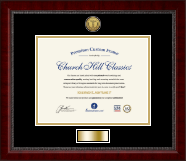 Choose one of our medical certificate frames, then customize and make it your own! You didn’t choose a career in medicine, it chose you. You put everything you had into those challenging labs, grueling exams, late-night study sessions, and clinical rotations to get your college degree, pass the MCAT, earn your med school diploma, and obtain that medical license. 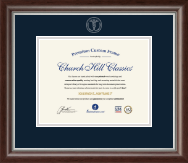 All of these amazing achievements should be celebrated and showcased in medical logo medallion certificate frames or embossed medical seal frames for your office wall. 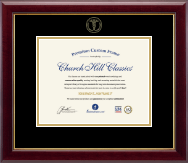 Our medical profession frames can be used in a variety of ways in your office, hospital hallway, examination room, or waiting room. Know a top doctor? 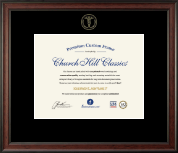 They make great award frames. Looking to feature photos of all the physicians in your practice? Use them as embossed picture frames. Need a grad gift for the medical student? They make ideal college graduation frames. 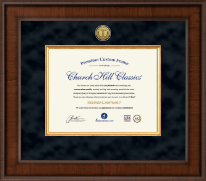 No matter what you’d like to display, do it in style with our official medical seal custom frames.